The sun wasn’t that hot. The track wasn’t that long. The going wasn’t that tough. And yet, all along the shortis Kalbarri Natures Window walk, people were dropping like flies. Despite the detailed warning signs above the steep staircase accessing the track below the gorge rim, the walk to Kalbarri National Park’s favourite attraction looks deceptively easy. Nature’s Window is a mere 400 m (1312 ft) from the car park. AND hikers straggling along the track towards the knot of people on the ridge below are clearly visible from the trailhead. AND the light breeze above the rim keeps the temperature mild. So who WOULDN’T assume they could knock the Kalbarri Natures Window walk over in shoes more appropriate to, say, streetwalking? Without water?? A hat??? Or a reasonable level of fitness???? Below the rim, the temperature in the gorge is much higher and the sun beats down mercilessly with no breeze to cool the air. It’s hot. It’s stuffy. And the return walk is relentlessly uphill all the way. Just like the warning sign said. 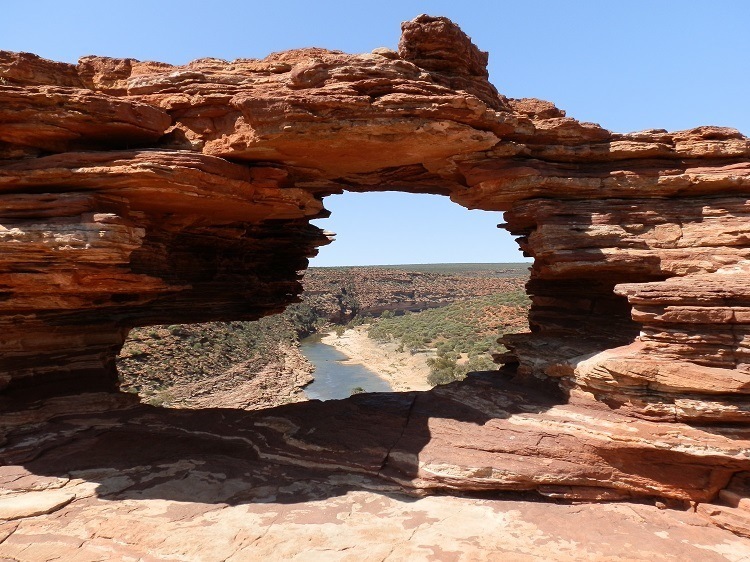 But surviving Kalbarri Natures Window Walk is easy if you follow my TOP 5 tips! Don’t, under ANY circumstances, attempt the walk with a hangover! While awaiting our turn for the obligatory Nature’s Window photo, the staggering view of the Murchison river far below, lazily curving around the rocky spur on which we stood was a momentary distraction from the bickering English honeymoon couple already in the fast lane to divorce. And the backpacker with an impossibly complex camera that would have captured the amazing panorama superbly had he actually known how to use it. Undeterred by the above average probability our Window photos would bear an astonishing similarity to everyone else’s, it was finally our turn to record our first Tumblagooda Sandstone experience despite the danger of cliché. A few kilometres away, the Loop Lookout put Nature’s Window into perspective. And also showcased the aggressively scenic – with a far greater risk of heatstroke – 8 km (5 mile) Loop trail winding down to the river below and starting and ending at the Window car park. 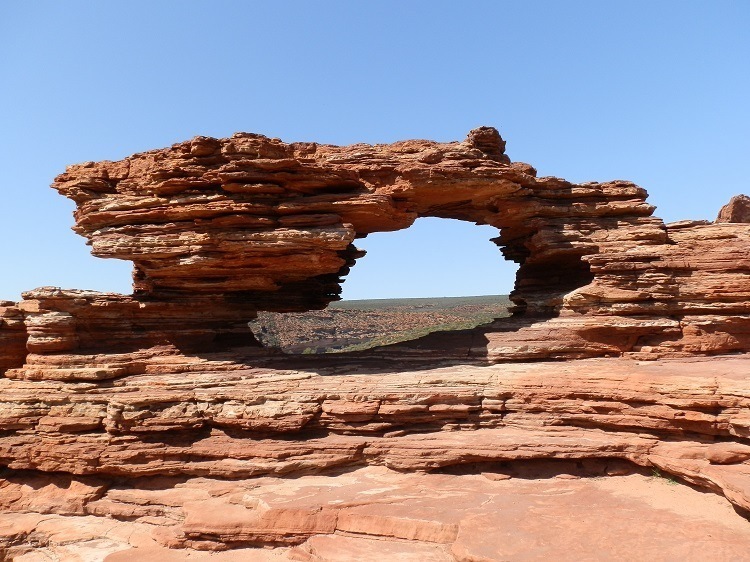 But for now, we’re content with surviving the Kalbarri Nature’s Window Walk! Previous Post: Aussie ABC: N is for Nullarbor! @Hilda – I actually saw some hiking boots with stilettos – lace ups, thick rubber tread, and HEELS!! Who knew?!?! @Glen – Haha! But you KNOW you’re a Brit Tourist when … rivers start smiling at you!!! @whiteangel – Hell, even I didn’t realise how hot it would be!!! Those warning signs are there for a reason!! @Sami – Yeah, same! Next time we’ll go when it’s a bit cooler & do the hike in the morning!! If you look REALLY carefully you’ll see the Window just below the carpark in the panorama shot!!! Amazing, huh?! Great photos Red. I have been there and loved the beautiful scenery. Didn’t do the 8km loop though….far too hot! The panoramic photo with the car park is amazing! Your blog posts are always worth a visit and this one is great. What a beautiful feature. Too bad you didn’t get to enjoy it alone. I love it when I stumble across a spot when no one else is visiting. It would have been nice to enjoy this sort of marvel in peace. Happy travels. That rock formation is just amazing and the views are absolutely stunning! Your fellow hikers sound like an awful bunch, though. And, hey, I’ve seen tourists here trying to walk on our beaches in stilettos. It’s just crazy. Oh, these pics brought back memories! We used to live in Albany, and took a trip up to Kalbarri many years ago. What a stunning environment! Natural Bridge at “The Gap” was our town’s cliche shot – The “edge of Antarctica”. I must say that your cliché shot is excellent, as are all of your photos. We’re constantly amazed at the lack of preparation on the part of some of the hikers we meet on the trail. I’m glad it’s not just an U.S. phenomenon. @Iris – I can’t imagine walking this track with a hangover … maybe that makes me un-Australian?? But I also can’t imagine being there alone! In the middle of the day and the middle of the tourist season, there’s no escape! @Jill – I’ve felt like handing out a few fashion infringement notices too!! I didn’t have to worry about hitting my head – not standing in the window is what comes of not having a good head for heights!!! @George – Or maybe it’s the US visitors downunder?!?!?! Only kidding, the lack of preparedness knows no national boundaries!!! @Vicki – Actually, I’m not sure I’d prefer it if the heatstroke & heelers DID visit virtually! Pointing out the foibles of others is one of the hidden joys of blogging!! Does that make me a bad person??!! I’d love to see your Albany clichés too – and I shall one day!! @Amanda – Hahaha, the whingers are worthy blog-fodder … I think I’d miss them if they weren’t there!! But I usually leave them behind by continuing past the hot shot tourist spots!!! Amazing what you see isn’t it when you go walking to the must-do sites. We have seen many an unprepared international tourist – most memorable are – no hat & 500ml water between 2 (30+ heat, Keep National Park, NT), high heels (the Blowholes Albany), high heels again & starting at 4pm (Bluff Knoll, Stirling Ranges). I guess Kalbarri is relatively close to Perth, and 500 metres doesn’t sound far! Ps – another pointer to remember to survive Natures Window – don’t bounce around under the rock and hit your head – which my 6 year old did when we were preparing to take the obligatory in-the-window photo years ago. You can tell by his photo he wasn’t feeling great! LOL, oh by golly, with a hangover!!! Yikes, I remember heaps and heaps of blowies and, ewwww, moths, yikes-yikes, yikes! Now is that good or boring, we were all alone there, apart freom said blowies and moths. @Mrs Tuna – I guess arid regions have similarities wherever they are!!! I guess that means there’s no point you visiting OZ?!?!?! @BFG – Other than hungover backpackers, I doubt many people would regret a visit to Kalbarri! @LONDONLULU – Tragically, I can’t see a bakery through the window … but yes, I AM lucky!! @Beach Bum – Hahaha, NEVER follow a drunken backpacker – RUN LIKE HELL!!! @FigMince – HAhaha, overcoming my vertigo just to shove a bogan through the window might just be a bit extreme … Maybe next time! @Sallie – One day I’ll have the guts to film AND publish what the worst dressed hikers are wearing … it’ll be AWESOME! @River – Sneakers with a good tread would be fine for this walk, and most I have been on. Hiking boots offer more protection when the track is very rough and/or rocky. Most tracks here are well-formed – Pilchard was quite happy with his sneakers! @Journey Jottings – I look forward to seeing your next Outback adventure!! @PDP – Haha, similar?? Don’t you mean ‘identical’? @TMWH – It’s one of the great tragedies of life that you don’t work for the OZ Tourism Commission with THAT point of view!! @Fun60 – No one can accuse us Aussies of confusing people with our place names! @TFG – Unprepared tourists are a travel blogger’s best friend!! @Dianne – At least the cliché shots are MY cliché shots! I’ve actually been in a group of hung over backpackers. Ir was in Colorado and we got so lost. I got as far as Nambung when I was in WA. Always meant to get to Kalbarri, never made it alas. But I’ve “seen” it through your photos which are great. Stripper shoes, boguns, Bali and sneakers – hahaha. @diane – For such a big river, it sure gets hidden away!!! And I don’t care about taking cliché shots – because they’re MY cliché shots!!! @Andrew – Haha, yes the Sara Lee analogy works well! And there’s no point googling ‘Nature’s Window’ now that you’ve seen my shots – all the others will look like some variation of that too!!! And you’re right about the location – no crocs that I’m aware of!!! @MJWC – Haha!! I wasn’t climbing up into the ‘frame’ for ANYTHING!!!! @Carole – Never say never, girlfriend!!! But it’s always a pleasure to hunt down and shoot places like this!!! @Barb – Oh, you lucky girl!! All these places deserve several re-visits from me too – but I hope it doesn’t take 40 years!!! @eileeninmd – The hike didn’t take that long … it was all the stopping for photos that took the time!!!!! Hahaha, only kidding … it’s a beautiful spot, you just have to watch the weather!! This looks like some of the National parks in Colorado/Utah . And unfortunately some of those same damn people seem to visit at the same time we’re there too. At least I know the US isn’t alone. Have you noticed how the ladies with those “shoes” always have to hold hands with their guy as they totter along blocking the trail? Top marks for the post and pictures, Red – and bonus points for not shoving the bogans through the window. Mind you, you might’ve got more kudos for actually doing it. Glad you had the stamina to show us these marvellous views! There is just no telling how unprepared some tourists can be. Great photos and story. Loved this post. As amusing as always. We have all come across the tourists taking the obigatory photos when they need to use their eyes and other senses to appreciate nature at its best. What an apt title – ‘Nature’s window’. Any peeping Tom’s in Nature’s Window? I can’t tell you how much Oz looks like Arizona. It’s the most beautiful window I’ve ever seen. i had to get out my map to see where Kalbarri NP is. one question…what would you recommend as suitable footwear? Sneakers with a good tread? Or would a person have to buy hiking boots? Obviously the glittery stilettos wouldn’t be appropriate. It might be cliché Red but definitely worth the walk …. Read Red Country. The shots never look cliche to this woman sitting in New Jersey. Bah! It’s only cliché to those people too silly to look at the world with the wonder it deserves. I love how wonderfully you showcase the beauty of Oz, Red! I think I may have a similar picture somewhere Red. It is a pretty magnificent sight. Stripper shoes..haha! I bet it’s happened! Don’t we live in a fabulous country! ha,ha I absolutely love your humour in this post and of course have in the past as well. What great photos you have at the top of Nature’s Window and I did spot the car park in the distance. It amazes me too how many times I have gone on a little shoot of my own, only to discover someone else along the path that will stop me and ask if I know how to use their camera so they can take a photo. Point and shoot would be an answer to many of these folk. I have picked the shot overlooking “Murchison River as my fav and all the photos are quite lovely, as the red sandstone, walls n windows of your wonderful land remind me of our very own, along the beaches of our “RED” Prince Edward Island. Have a great day Red. Great post. Oh yes, nice sandy river beach. Where are we? I think too far south to share the river beach with crocs. Wow, what an amazing view. I love the Nature’s Window. A great name by the way! And the curvy river shot is awesome. Sounds like a hard hike, how long did it take? Awesome photos! So you made it to Natures Window… and survived!! Whooo Hoooo… great pictures you got for us. The window itself looks a little shaky to me. A Sarah Lee construction, layer upon layer upon layer. Clichéd or not, I have never seen it before, so thanks. Fabulous pictures I think that is rot about cliche shots. what else can you do if you want a shot of these types of “monuments.” other than lie on your back and shoot up or on your tummy and miss the river. or a close up and only get half of it. I feel the same about what is called “postcard ‘ shots. I wish I had climbed up there but our tour group only stayed at the Carpark lookout. I was amazed at how the river is hidden until you are right on top of it.